I have a Dyson upright vacuum. It was a gift from my awesome mother-in-law. With the exception of Fred, it’s probably the best present I’ve ever received. If you had told a younger version of myself that I would be excited about getting a vacuum as a gift I would have laughed at you, long and loud. But I love that darn vacuum. Except… I live in a two story house with a finished basement. There is a full set of stairs leading up to the second floor and another heading down into the basement. Both flights of stairs are carpeted. Both are high traffic areas that get dirty. And vacuuming those stairs is one of my least favourite chores, ever. Carefully lugging the Dyson up one step at a time and swiping it back and forth on the narrow steps. Ugh. My vacuum, which in reality is pretty light, suddenly feels like it weighs two thousand pounds. I usually talk my husband into doing it (and I don’t exactly think it’s his favourite chore either). Disclosure: This post is sponsored by Dyson and some links within it are affiliate links. When you make a purchase using an affiliate link I get a small commission at no cost to you. As always my words and opinions are my own. Other vacuums tip over and stay down. The Dyson Cinetic Big Ball canister is the only vacuum that self-rights when toppled. Dyson engineers made this possible by assembling the vacuum’s components in a spherical array, with the heaviest nearest to the floor. Placing them inside a curved body with a low centre of gravity means that whenever the vacuum is knocked over, gravitational forces will automatically return it to its upright resting position. Core components are housed within the ball, allowing the vacuum to turn on the spot and follow you effortlessly around the home. No awkward moves. As the bin is emptied, a silicone collar slides down the shroud. This scrapes off trapped dirt and debris, removing it completely. There’s no need to touch the dirt or reach inside the bin. Plus, the bin is 33 per cent bigger than previous Dyson vacuums. The wand’s articulated handle now rotates in three directions, allowing 360° movement for easy, versatile cleaning with less effort. 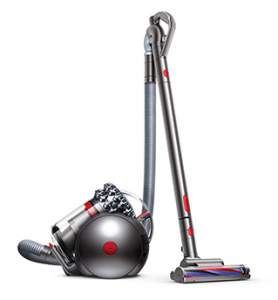 The wand is longer than previous Dyson vacuums, extending up to 125cm. And because the hose is kept closer to the wand, it reduces the machine’s storage footprint. The only vacuum with no dirty filters to wash or replace. Dyson Cinetic vacuums captures the microscopic dust before it hits the filter. Dyson Cinetic Big Ball features 36 Cinetic tips that separate the microscopic dust that clog other vacuums. Vacuums with Dyson Cinetic science do not lose suction, and capture dust, dirt and microscopic particles down to 0.3 microns in size. The dust separation is so efficient there’s no need to wash or replace the filter. I’m excited to get my hands on one of these shiny new machines and test it out. Never loses suction, no filters to wash, and even self-rights itself when knocked over, I mean, doesn’t that sound like the dreamiest canister vacuum ever? 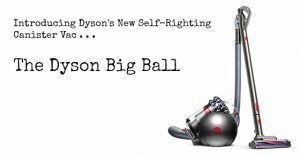 For further info check out the Dyson webpage, where you can shop the brand new Dyson Big Ball line up. Wow! 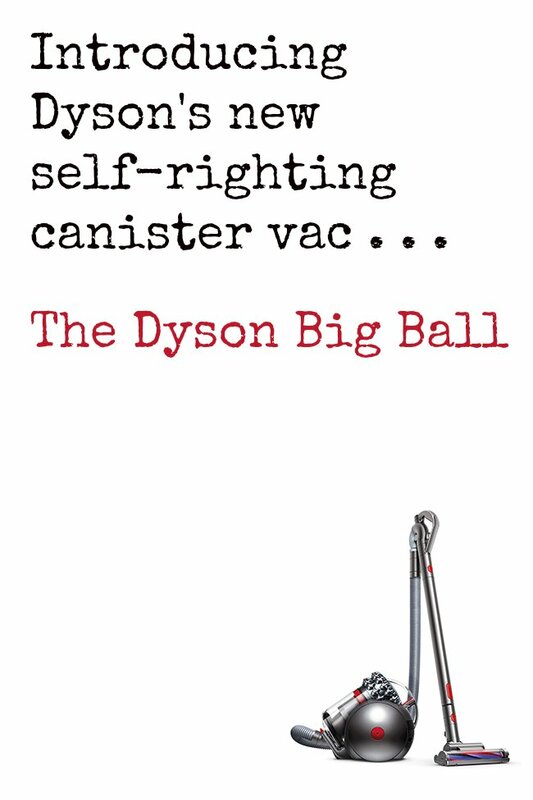 This new Dyson Big Ball Canister vacuum sounds amazing. 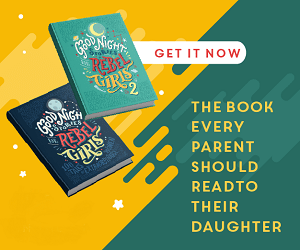 I went to their site, as you suggested, and watched the videos. . I own a canister vac already but it is bulky, tips over all the time, filters are costly and I always end up dusty when I empty it. I think it’s time for a shiny new replacement. Thanks for the review. This looks like a super vacuum. Having carpeted stairs would be a pain. Mine aren’t, but I still think I have enough vacuuming to do. Dyson make such great vacuums. This looks like a great vacuum to have, I love the Dyson vacuums but they are way to much for me to buy one!! I have heard so many great things about this vacuum I dream of getting one someday !! 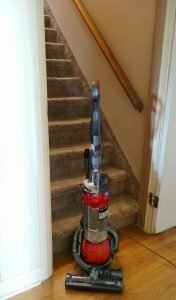 I had the same problem as you: always having to lug my gigantic heavy vacuum up and down the stairs to clean them. I got so tired of doing that I had vinyl runner placed over the stairs so I don’t have to vacuum them anymore. Regardless, I still would love to own the Big Ball. It sounds like an amazing vacuum. This is my dream vacuum, I would love to own a Dyson Ball Canister Vacuum. This looks sick, looks like something that is from outer space! I seriously LOVE dyson products. So reliable! Vacuum sounds like an absolute dream. I just like vacuuming and general but with this vacuum I think it would make the task a lot more bearable for me. A vacuum is definitely worth the investment – with that being said, I sure hope to get a Dyson soon.